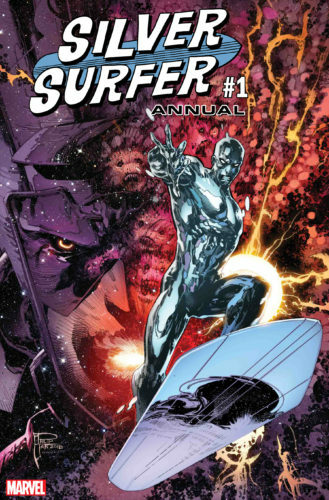 In recent years, Dan Slott and the Allreds have turned the Silver Surfer into a character full of more than inspiration — they made him fun. That’s reflected in the redesigned logo for the character, much jauntier than the one used for decades. Seeing that juxtaposed against a grim, powerful Philip Tan cover just seems wrong. Maybe Marvel should consider that for one-offs like this, out of step with the tone of the regular book, it’s okay to revert to a different logo. Marvel promises a “dark and tragic past” in this annual, a here-to-fore untold story. Except, it kind of has been by Jim Starlin, Stan Lee, Ron Lim, John Byrne, and others. 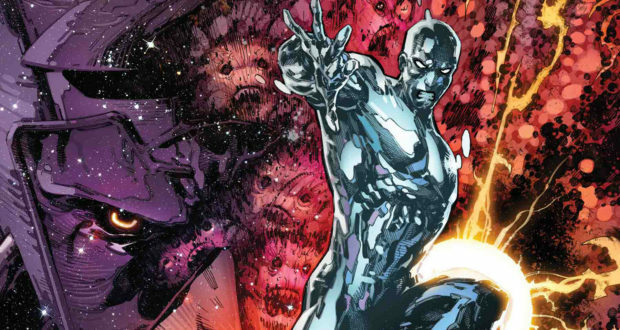 I’m not casting doubt on the quality of this one, just know that other storytellers have explored this, too — a rich, deep mine for Norrin Radd and the years he served Galactus with a less-evolved conscience.